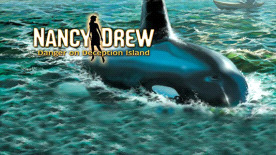 A much-anticipated vacation to a remote island in the Pacific Northwest abruptly runs aground when you, as Nancy Drew, discover that an unseen assailant has vandalized the whale-watching boat owned by your host, Katie Firestone. But that’s just the first in a string of nasty “accidents.” Is the brought in Snake Horse Harbor related to the orphaned orca whale roaming the nearby channel, or is there a deeper threat shrouded in the approaching fog? Plunge into danger to bring a mysterious island’s secrets to the surface! Dare to Play. Kayak in coastal waters and caves. Solve puzzles using Morse code and the Anagram Buster. Build sandcastles, dig for clams, and play chess.